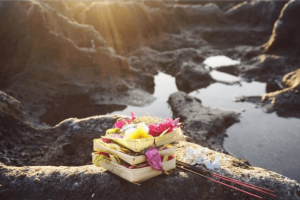 Offerings: What are these small palm leafed trays called offering related to Hinduism religion in Bali? What’s the deal with these little offerings you will find everywhere? First time in Bali, first thing you notice: All these small palm leaf trays you will find on the street, in front of your hotel, at the beach, inside the temple, inside that store, literally everywhere! So what’s the deal with this small tray made from palm leaves? It normally contains flowers, candies, coins, even cigarettes. And always always a burning scented stick that…oops make sure you don’t step on it! Did I mention it burns? Myself despite being in Bali for three years, I didn’t know much about the offerings other than their relation to the Hinduism religion. So, I am learning along with you as I am doing my research and writing this blog. The palm tray is also called Canang sari. It is the daily Balinese Hinduism offering to thank the Sang Hyang Widhi Wasa or Acintya – the All Mighty God, Supreme God, All in One God – you name it. Though the Hinduism religion is famous for its one too many gods, Acintya corresponds to a rather recent trend towards monism in Bali. According to this trend, there is one supreme god, and all other gods are only manifestations of him. Acintya also means emptiness and Hinduists believe that all other divinities derive from him. Prayers and offerings are not made directly to Acintya. They are made to the other manifestations of the deity. 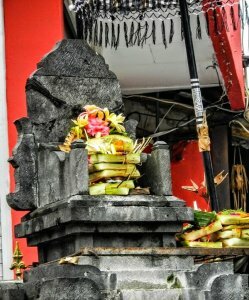 He is often not represented, that is why you will often see an empty throne on top of a pillar (the Padmasana or Lotus Throne), inside Balinese temples. Also, he is often associated to the sun god. He is depicted in human form with flames around him. His nakedness expresses that his consciousness is no longer carried away by his human nature. But to every ‘bule’ (=slang for foreigner in Bali) here, this palm tray offering together with the smell of the burning stick, is one of the many many things that gives Bali its special character and makes this place so unique.